1. Is there a better time of day to see the whales, or when they are more active? No two trips are alike and every day we have a trip that is the best but there is no way to know which one it will be before the time, it is all up to nature. We offer daily trips, weather permitting, which depart at 9h00; 12h00 and 15h00. No time of the day is better or worse for the whale sightings; it’s best to choose the trip time based on weather and what suits your travel plans best. If you are staying in Hermanus overnight then it is best to join on the 9h00 departure as then it leaves the rest of the day for other activities or traveling and the sea can often be calmer in the mornings. 2. Would we need to book a whale watching boat trip in advance or can we turn up on the day? It is always better to book in advance as that secures your trip, payment is only required upon departure, as all of our trips are weather permitting. 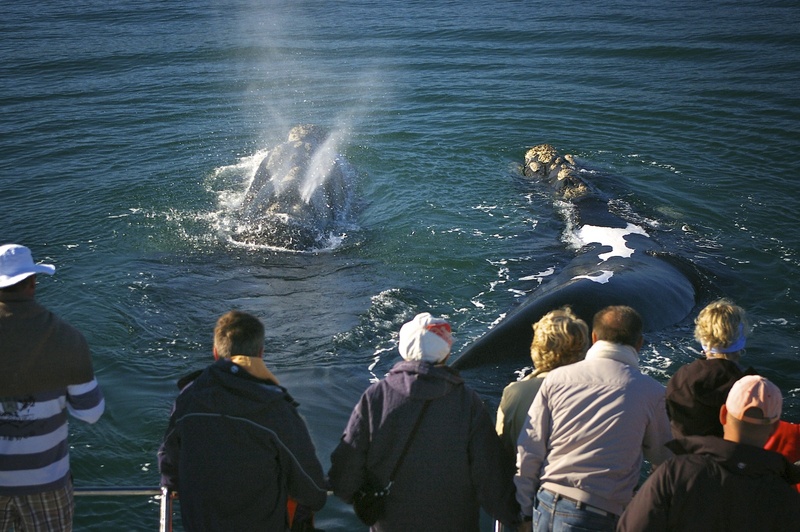 You can confirm your booking by completing our whale watching enquiry form or call us +27 823530550. 3. Are we guaranteed to see the whales? We never like to use the word ‘guarantee’ as it is nature but with that said it is very rare that we do not encounter whales. Hermanus is lucky, as the bay is much loved by the Southern Right whales and in peak season there is easily 100+ whales in the area. If by some chance you do not see whales on your trip we do offer a 50% refund on your ticket price paid or the opportunity to join us on the next available trip for free. 4. What is the duration of the boat trip and whale watching tour? We do not cap our trip time as it all depends on the traveling time to the whales. The trip itself can be 1hr 30m – 3 hours maximum. The trip time averages at about 2hours. 5. What happens if the trip is cancelled due to weather? We only cancel on the day if the weather is poor, as the forecast can often be wrong. We would call you to let you know and then based on availability will re-book you for when suits you best. We always have a watchful eye on the forecast so feel free to call us a day or two prior to your trip for an update and possible re-shuffle of your booking. For direct bookings you only pay on arrival so that eases the hassle of refunds in case your trip is cancelled due to weather. Any tickets booked directly and paid for prior will be refunded in full if we cancel the tour. Due to the whale season in Hermanus occurring during South Africa’s winter months, cancellation can often occur so we would always recommend booking your trip for your first available day so that if it is cancelled, then you have the next day as an option during your holiday. 6. What time must I arrive for my whale watching trip? Arrival time is 30 minutes prior to departure time, as we have an on-land briefing prior the trip. 7. Are there any age limits for children? There is no age restriction but adult supervision is a must and it is regulation for all children under 12 years old to wear a life jacket at all times. If you child is an infant, chat to us prior to your trip about what is best to bring a long and life jacket sizing.